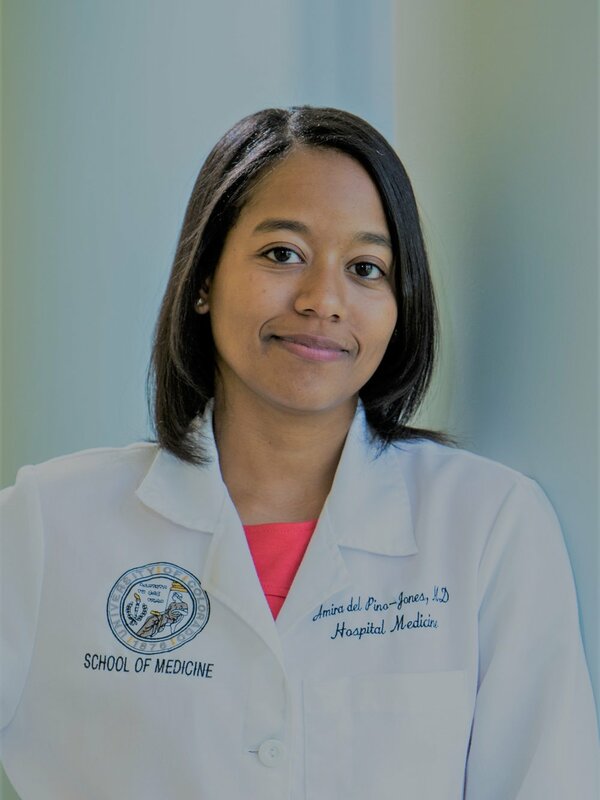 Amira del Pino-Jones, MD is an Assistant Professor at the University of Colorado. She received her undergraduate degree in Environmental, Population, and Organismic Biology (EPOB) at the University of Colorado at Boulder and also completed her medical school and residency training at the University of Colorado. She is a hospitalist at the University of Colorado Hospital and is the Director of Diversity, Equity, and Inclusion for the Division of Hospital Medicine. Dr. del Pino-Jones directs the University of Colorado Hospitalist Scholars Program (CUHSP) and Leadership Education for Aspiring Doctors (LEAD) which are educational/mentorship programs geared towards diverse undergraduate students interested in learning about training and careers in medicine, Quality Improvement (QI), patient safety, transitions of care, and leadership in Academic Medicine. She is involved in projects geared at improving transitions of care for under- and un-insured patients as well as patients with Sickle Cell Disease. She is also actively involved in diversity efforts within the School of Medicine and Internal Medicine Residency Program.